Moon Jellies, Aurelia aurita Moon jellies are one of 200 species of jellyfish - animals whose slippery, watery bodies are so clear that you can see through them. Moon jellies have flat, open umbrella-shaped bodies up to one foot wide that look like miniature moons floating on the surface of the ocean. 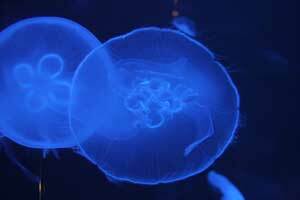 The most unusual thing about moon jellyfish is the way they have babies. Dr. Vagelli has conducted important groundbreaking research on the asexual mode of reproduction of Moon Jellies that will be presented at the upcoming meeting of the Society for Integrative and Comparative Biology (SICB), where his research paper, "New observations on the asexual reproduction of Aurelia aurita (Cnidaria, Scyphozoa) with comments on its adaptative significance" will be presented.